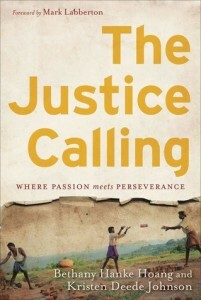 The Justice Calling: Where Passion Meets Perseverance is a comprehensive biblical theology of justice that is practically engaging. Bethany Hanke Hoang and Kristen Deede Johnson bring together their deep study of scripture and their direct engagement with human trafficking and slavery, their scholarship and their activism. “The source of justice in the midst of even the most heinous injustice in our world is Jesus Christ. God’s very character is one of justice, and he has given us Jesus as the manifestation of his justice both now and for eternity. God is the one who reveals the justice calling upon our lives, because God is the source of justice. You speak about this idea of moving into the darkness, how would you encourage someone who longs to do so but is paralyzed by fear? Throughout the book, justice work is defined as being long and hard, what would you say to someone who is burnt out from justice work? Click to download a free sampler of Chapter 1. « Interview with Ashley Null	» How Are You To Be “More Than A Conqueror”?